In my kitchen there are two slim dogs. Mme L has been ill with pancreatitis and is now on a complicated regime of micro meals and vet stuff to line her little tum with so she doesn’t vomit all the time. Zeb is in rude health once more after his leather eating trauma earlier this year fortunately. In my kitchen is a blackboard which usually says things like, buy chicken, or take parcel to post office. My blackboard was made by Andy at Arcadian Furniture who restores furniture and makes new pieces too. He made this board for us with just the right size ledge that it could hold a board rubber and chalk and made it out of the same wood as the kitchen, American Oak. The eagle-eyed amongst you will note it says ‘Eat Wed pm’ at the bottom. This is because Brian has had the lurgi for over a week and the doctor said starve yourself for 48 hours and drink Dioralyte. We are into 36 hours and I am joining in in solidarity till this evening, when we will partake of ‘clear soup’. Brian has decided we are going to have a Chicken Soup and has gone off to buy himself a chicken. The good news is that, so far today he feels better, so cross fingers the doctor gave him good advice finally. So what else can I show you? A stunning handful of fragrant frilly sweet peas grown by my neighbour. We are busily trading lettuce and flowers, cheesy buns and vegetables. My neighbour drives out to visit her mother who is now in a Nursing Home, she who likes my bread, and it is very near a wonderful vegetable grower called Mark Cox who gardens at the Walled Garden at Wrington. My neighbour is allowed to pick what she wants more or less and she brings me treasure once a week; last week I had the most beautiful broad beans, chard, cavolo nero, newly dug potatoes, and a perfect artichoke. I have baked more bread in the kitchen, mostly of the sourdough variety. Here is a particular fetching loaf, which someone on Twitter described as a Tin Tin loaf without the tin. A bread with a quiff! At the moment as it is hot here, the easiest way to make the bread is to mix it in the evening, retard it in the fridge, shape and prove early in the morning and bake it. Works for me just fine! In the freezer I discovered three halves of pheasant that I bought from a local butcher in pheasant season earlier this year, so I have made them into a casserole, once I had pulled all the bits of shot and feather out I could find. My casserole consisted of the pheasant, cut into smaller joints, sweet onion and carrots from the Walled Garden, two sticks of celery, herbs from the garden, silver thyme, Greek oregano, sweet Cecily, bay leaves, a few peppercorns, a couple of tablespoons of ancient Pontack sauce (made from foraged elderberries in times of yore) some Chinese rice wine, and vegetable stock. Pheasant is a dry meat to my mind but it is all cooked up now and boxed and back in the freezer for another day. I also had a crack at making the claypot pork dish that Celia made from Food Endeavours of the Blue Apocalypse blog. Here is a pile of bottles that I had to get in order to have a go at it. I already had a kg piece of belly pork from Thoroughly Wild Meat who supplies us with salt marsh lamb hidden in the freezer. I don’t have a claypot so I made it in my regular casserole. It smelled divine while it was cooking but that too has gone into the freezer as it coincided with Brian and his Lurgi. I have also made the fantabulous Ottolenghi turkey and courgette meatballs with sumac sauce, a recipe which is in his Jerusalem but you can probably find written out by someone or other on the net if you look. These little nuggets solve the mystery of doing something tasty with the incredibly boring meat that is turkey mince. I thought they were a bit fiddly to make but if you are set on eating turkey mince and have spare courgettes, then give them a whirl, because the end result is worth it. In my kitchen were our first veggies apart from lettuce and rocket – three pale green courgettes – which I fried with garden mint in a little butter and oil about five minutes after harvesting them and had them with some rice and chard while Brian looked the other way. I have been eating North Sea brown shrimp, odd bits of roast chicken, and lettuce and bread. Feeling guilty that I can eat and he can’t, though not that guilty that I couldn’t cruelly munch my way through half a bag of M and M’s last night while catching up on the White Queen on the telly box while The Hollow Man averted his gaze. After watching the White Queen (historical drama based around the time of the War of the Roses) I always have to spend ages on Wiki looking up the Kings and Queens of England, the Kings all seem to be called Edward or Henry and all the queens Elizabeth. Many of them are a little stressed out. I have no memory, nor interest in retaining their names and who was married off to whom in political unions but I am enjoying the White Queen, chiefly because I like the way they roll their eyes in a thoroughly modern way when they marvel and gasp at each other’s Machiavellian ways. But back to the kitchen – by the time I get to the end of this post it has indeed become Wed pm and we have made supper. The man vet said ‘clear soup’ we translated that tonight into Canja de Galinha – ‘a soup for what ails you ‘ – as made in the one and only Bewitching Kitchen by Sally. A Brazilian take on a Portuguese soup, which hit all the right notes for Brian being substantial but super low in fat and super soothing. Brian chopped the veggies and I poached the chicken and we cooked far too much rice, but we didn’t care. I invoked the spirit of my paternal grandmother Lily and got out her Willow pattern soup bowls which have nursed more versions of chicken soup than I can remember in their long life and hope that he is cured now. (I added a liberal splosh of chilli ginger sauce to mine as I hadn’t been on starvation watch, but I have never seen Brian attack a bowl of soup with quite such enthusiasm). I realise it has been far too long since I wrote one of these IMK posts, but if you want to read a whole lot more or indeed join in, you should visit lovely Celia @ figjamandlimecordial.com whose meme this is and peek at her sidebar as there are lots and lots of kitchens to visit from her links. This entry was posted in Blogging, Food, Meat, Poodles, Supper Dishes, Vegetables and tagged blackboard, canja de galinha, Courgettes, humour, in my kitchen, lovely neighbours, Ottolenghi, pheasant stew, sweet peas, turkey and courgette meatballs, Walled Garden Wrington, White Queen on 10/07/2013 by Joanna. The Dan Lepard fan club knows that in his repertoire of awesome buns are some absolute treasures to which one returns time and time again. My favourite three are the legendary soft white bap, the top teacake and our eternal favourite, the BBQ semolina bun. Known in this house variously as the duvet bread or the pillow bread because of the scoring to the top, I make this bread over and over again. The recipe for the Semolina BBQ buns is still available on the Guardian website and I don’t change anything at all when I make it. Today I made a double batch and made a duvet with one portion. With the second batch of dough I thought I would try something a bit different for me. When the dough had finished its first prove, I patted and gently rolled it out into a largish rectangle and spread it lightly with some wild garlic, grated pecorino cheese, ground almonds and olive oil made into a pesto-like sauce and a few sundried tomatoes. I rolled it up gently into a sausage shape and curved it into a ring. I set it on a sheet of baking parchment on a tray and put it inside a clean bin bag to prove. Before baking, I slashed small slashes in the top and brushed it with water and sprinkled fine semolina over it. I baked it at 240º C (220º C Fan) for 15 minutes and then reduced the temperature to 200º C (180º C Fan) for another 15 minutes and then took it out of the oven and left it to cool and stop sizzling on a rack. The bottom was very crusty. If you don’t like crusty then bake it a bit cooler. The trick with doing this is not to squash all the air out of the dough when patting it out to the rectangle, use the flat of your fingers to start the process off. When you use the pin, roll as gently as you can from the centre of the dough towards the corners to get a rectangular shape, and take your time. If the dough is pinging back a lot, walk away for five minutes and let it relax before you try again; try not to compress the dough too much, you are sort of stretching and fluffing it, rather than rolling and squashing. I am thinking about the way I pat out pizza dough rather than use a pin, though that is of course a different dough and more delicate than this. My dearest old neighbour from where I used to live came round for lunch and we ate in the garden, yes really it was warm enough to eat outside!! We were accompanied by the sound of building work from two doors down, visits from some very large bumble bees, and the grumbles of small poodles, but you know what, it was glorious! 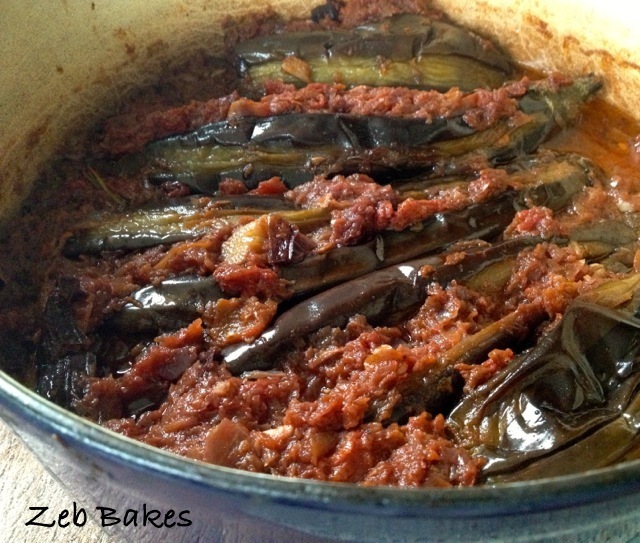 Brian had bought an entire box of aubergines for the sum of £2.75 at the weekend and even though he gave two-thirds of them away we still had lots left to cook, so it was more swooning and more olive oil and more Imam Bayildi for lunch today. I changed the spices slightly this time and left the onions chunkier, using allspice and a very new hot smoked paprika. We are still swooning… and I promise not to mention it again, but it is really very good indeed. This entry was posted in Bread, Flatbread, Vegetables and tagged Bread, Dan Lepard, Food, guardian website, Imam Bayildi, lunch, semolina BBQ buns, wild garlic on 23/04/2013 by Joanna. I have just tried my hand at making Imam Bayildi, which translates as the Imam Swoons. A dish so divine when correctly made that it has a ‘certain reputation’. This entry was posted in Supper Dishes, Vegetables, Vegetarian and tagged aubergines, cookery books, Imam Bayildi, Sally Butcher, vegetarian dishes, Veggiestan on 17/04/2013 by Joanna. Last week I made a celery gratin and a lentil salad side dish to go with it. I also cooked some tiny chorizo sausages that Brian had bought as they needed using up, so it wasn’t in the end a vegetarian meal, but it was meant to be. Good intentions eh? For the celery gratin I followed the method in Hugh Fearnley Whittingstall’s book on Vegetable cooking. I do have lots of cook books and after writing the last post I realise I am maybe not using them properly, so by writing the post it prompted me to open my books! You bake the celery covered in foil with aromatics and a little butter. In this case, I used bay leaf and thyme, both from my garden. Once baked and tender, I followed the recipe to make a sauce from the liquid exuded from the celery and a little cream and sprinkled the top with a mixture of breadcrumbs and grated hard cheese, such as parmesan and then put it back under the grill to bake and go an inviting golden crispy colour. I found it a little bland so if I was going to make it again I would maybe add some other vegetables into the mix, but it was good to do something I wouldn’t normally do and see how it came out. I am on much more familiar ground with cooking lentils. One of my favourites, and I suspect that of many other people too, are the Le Puy lentils which hold their shape when they are cooked and have a wonderful earthy nutty flavour. I boiled the lentils briefly first, before covering them in home made vegetable stock, the recycled bay leaf, (I have a whole shrub of it in the garden but I was feeling lazy) parsley stalks and a couple of cloves of garlic. For the vegetable stock I used the leaf and off cuts from the celery dish, some ageing carrots, parsley and an onion. Once the lentils had cooked, I drained them and dressed them while warm with a little balsamic vinegar and oil and then added some cubes of yellow beetroot, cooked the day before, some feta cheese, some little tomatoes, spring (salad) onions and some basil and salad leaves. Together with another bowl of salad leaves and some pita bread popped in the toaster direct from the freezer this was a happy meal which we shared with our lovely neighbour last week. These sorts of dishes are really adaptable to using up small quantities of salad veggies and bits of cheese that you need to use up. They are colourful, a healthy mix of food types, and they store well in the fridge once mixed, good for lunch boxes too! This entry was posted in Supper Dishes, Vegetables and tagged celery gratin, cooking lentils, Food, Hugh Fearnley Whittingstall, lentil salads, parsley stalks, puy lentils, supper, vegetables, vegetarian on 25/02/2013 by Joanna. I found myself putting this together the other night and when I had finished I realised that it was very similar to the sort of food my mother cooked, when she cooked, which wasn’t often. Her food usually involved some sort of lean meat, pork was a favourite, paprika, and cream and a slosh of sherry. For cream I substitute creme fraiche as this doesn’t trigger Brian’s asthma like sweet cream does. I like the tangy taste it contributes to the sauce as well. To make biber salcasi the way I like it, which is not too hot, you can do one of two things. Use cheap red peppers if they are in season or buy a jar of already roasted and skinned peppers from the supermarket or middle eastern store. If you buy fresh ones. Put the oven on and roast them on a tray until the skins blister and soften. Then peel the skins off and remove the inside white parts and seeds. Save the liquid that comes out from the middle and add it to a stock or a soup as it is delicious. Puree the roasted peppers with salt to taste, start with a teaspoon for about 6 large peppers, and as much or as little fresh red chilli as you prefer. I use relatively little, but I am a wimp. Spread the pureed mixture on an oven tray and put it back in the oven on a low temperature. This is to evaporate the liquid and thicken the sauce. If you live somewhere hot, you can of course just put it out in the sunshine. Store in a clean jar, covered in olive oil in the fridge. Make little and often and you should use it up fairly quickly. You can add this simple sauce to all manner of dishes, soups and vegetable dishes in particular when you tire of tomato with everything, but still want the happy red colour that tomatoes bring to a dish but with the delicate bitter-sweet quality that roasted red peppers offer. Just before you are ready to serve, stir the creme fraiche into the pan and make sure it is well mixed and everything is hot. Don’t let it boil. Serve with plain rice and a green vegetable of your choice. I used the last of the flower sprouts which are just about all we have left growing in our veg bed right now. Just right for a wintery day and it doesn’t take that long to make either! This is how I cook most of the time – no cook book, just a memory, I tend to cook most of our suppers that way, either from memories of food I have cooked before or been given. My evening meal tactics are pretty basic. What needs using up? What is lurking in the fridge and the freezer? Are there leftovers that can be turned into a meal? That’s the first stage. The next one is to think what we have had in the last few days and what might be nice to have. If we have been eating too much of one sort of food then we choose something else. Speed plays a huge part in the process. If I have left it too late to think about supper then simple and speedy wins out every time, opening a book would slow me right down, so I rarely bother at that point. So we live on stir frys and steamed vegetables, baked potatoes and risotto, kedgeree. If my neighbour comes for supper I try a little harder, I might make Nigel Slater’s Thai Fish cakes, or a vegetable gratin. Occasionally I might see a lovely dish on a blog and I certainly book mark some amazing food that I see on the internet. But in real life, in real time, I make simple speedy food and try to waste as little as possible. This entry was posted in Food, Supper Dishes, Vegetables and tagged biber salcasi, cooking, dinner, Food, pork with red peppers and creme fraiche, simple supper dishes on 23/02/2013 by Joanna. My gesture towards autumnal hunter gathering (ha!) has been limited this year to these two little projects. Rosehip and (assorted friends) cordial and the hawthorn ketchup recipe which comes from Pam Corbin’s book Preserves but can be found fortuitously (and probably not very surprisingly) in Hugh Fearnley Whittingstall’s Guardian Weekend column this week along with other fashionable hedgeforagy ideas. More about haws here in Alys Fowler’s column too. I managed to make one little jar from 500 g of hawthorn berries. Not sure if it was worth the effort somehow! I barely picked any blackberries and there were very few sloes, apart from a few I found in the freezer, the damsons were almost non existent and the squirrel has stolen and buried all the nuts – so it goes. And I suspect that this is the same for many people, hence the interest this year in the hawthorn berries and rosehips which are plentiful. I am working my way through the apples from the garden slowly. I spend a lot of time not doing very much and what I do, I do quite slowly. Here is a squishy apple cake, which I made yesterday from a recipe from Cooks Illustrated by Andrew Janjigian. It is made with oil not butter and has a clever construction whereby you mix egg yolks into part of the batter for the bottom and extra flour into the top part thus creating a layered effect in the cake. I am not sure I did it justice as I was working from cups, which as we know is not my strong point. Edit : My apples are for some reason all floating to the top in any cake with a soft batter. I think it is me as it has happened now in a couple of cakes ! I have added a link to the recipe, which I didn’t have earlier and I see there is a video too… if I had known…. ah well there is always next time ! I ‘tore’ up the original bright and breezy tra la version of this post as I need to find a new voice. I am not a good housewife, I am not a good gardener, I am just a fallible and imperfect human being who for some reason strayed into the blog world and stayed for company. I like your company. Truth. Sometimes I think I am channeling the Guardian. Alys Fowler confirms that it is perfectly acceptable to rehome supermarket basil in this week’s magazine too. I can report that my two are still rampaging away and people come and lop stems off and cart them off. It really is much the easiest way to keep them going with minimum fuss and outlay. I am not convinced by the micro herb thing. Seeds, though not expensive when you grow full size plants from them, do become pricey for relatively small return when you eat the results so small. They don’t always come out nicely either, sometimes very small and a bit stringy and sad, if you don’t have ideal growing conditions indoors. Outdoors the flower sprouts, which now dominate the raised bed with their dark and purply presence are…. yes they are…. growing flower sprouts – this is quite exciting for me as I have never grown sprouts in any shape or form. They are frilly and they lie in the space between stem and leaf. Ooh! The broccoli rab threw up two leaves, a yellow flower and died in the shadow of the giant flower sprouts. The winter creeping thyme drowned mysteriously having started off quite well. The half a dozen bulb fennel babies are living in their fortress where I shall protect them from the marauding pigeons if I have to sit on the veg bed with a knife between my teeth. Brian has taken a beautiful photo of the Trail of Tears beans drying on a north facing windowsill. And what else did I think might amuse you as you dance through the internet? I attempted to clear one tiny corner of the garden yesterday, with much moaning and wingeing and pulled out the cold frame with Brian’s help to give it a rudimentary tidy up before the winter and managed to disturb Madame Frog. She made me scream of course but then I steadied my nerve and picked her up to move her to an undisturbed spot and I swear she is is smiling here. You have heard of Puss in Boots? This is Frog in Glove. Zeb went to look for the frog but he has some funny ideas. NB For Rosehip Cordial. Pick as many ripe rosehips as you can manage. Put them in the freezer overnight to help soften them. Cook them gently in water until you can mash them up. They have little hairs inside so you do need to strain them or let them drip through a fine muslin in order to get the juice out, as you would if you were making jelly which is also an option. I added a handful of blackberries and some other bits and pieces to use them up but you don’t need to do that. Then once you have your strained juice, add 325 grams of sugar or so to each 500 ml of juice, heat till dissolved but do not boil. Then bottle in clean bottles and heat in a water bath if you don’t have a canner. The water bath is basically a deep saucepan with a clean folded tea towel in the bottom full of water in which you stand the bottles up to their necks and then bring the water up to a set temperature for a set time, (varies depending on what you are canning). If in doubt freeze your cordials if you have space and then you won’t have to worry about this. This entry was posted in Blogging, Cakes, Garden, Keeping in Touch, Vegetables, Wild Food and tagged drying beans, fennel, French apple cake, frog, hawthorn ketchup, rosehip cordial on 15/10/2012 by Joanna. turn around and say, “good morning” to the night. Seedy Penpals is up and running thanks to the hard work of Mel at Edible Things and Carl Legge. Some of the people doing it I know a little, like Carla in Rome, and Maria Paola in the New Forest, but we are not necessarily paired up with people we know and in fact that is part of the excitement and the mild terror of writing to someone you don’t know at all, have no clues about at all, except a willingness to reach out to another human being and begin tentatively to make contact. (like something out of Alice in Wonderland) a selection of Japanese Greens, Chervil and Corn Salad for autumn eating – in salads and stir frys I am hoping. I have sent in my turn some seeds to Michelle who also runs the 52 week salad project (we don’t send and receive to the same person) which somehow got put to one side as I went up and down the country earlier this year. I will post something about that again soon. I have been reading loads of gardening blogs and thinking about how very hard people work at their gardening. I think too about all the thinking that goes behind it, the exploring and the reading, the fine tuning and most of all the complex set of emotions that growing food and flowers, raising trees, looking at soil and weather engenders in our hearts and minds. At the risk of romanticising the work, it is a wonderful thing to be able to do and embeds you in your life in a way that sitting in front of a computer screen can never do. I don’t get involved with that many people I don’t know – let me amend that – I don’t think of myself as someone who is good at making new friends – but – of course I have made new friends with people who read this blog, people I have met on baking days, people I talk to when I walk the dogs and people I tweet with on Twitter. Some of them I will never meet in person, but all the same, there is connection, a reaching out to the Other and as you get older this is increasingly precious. Here are your seeds coming up Joyce! Fingers crossed and I will let you know how they do and what happens next. Thank you so much for being my Seedy Penpal. It was thrilling to receive your seeds and I hope I can nurture them well. This is just the start and Seedy Penpals will be carrying on into the future, so if you want to join in, even in the smallest, most tentative way I know you will be welcome! Do you have friends you will most likely never meet? In my teens I wrote to a prisoner in a German prison, something my language exchange family suggested. We wrote for a few months and then I think he left prison. He just came back to my mind, but I am not sure I can remember his name now and that is the other thing that all this reminds me of: friends do indeed come and go; there are people with whom you have great long exchanges of emails who then just vanish again, but that’s all fine, life is like that. This entry was posted in Garden, Vegetables and tagged flowers, seedy penpals, Twitter on 25/08/2012 by Joanna.